Almost every year, as soon as the weather gets warm, I become obsessed with a simple, single layer cake that can be made in little time and that I promise will be all you need to be welcome at any picnic/barbecue/cook out/pot-luck that summer. Three years ago, it was a raspberry buttermilk cake, which was the equivalent of taking a single, thin layer from the very best yellow birthday cake you’ve ever had, scattering fresh raspberries over it and baking it until bronzed and perfect. Needless to say, it went on repeat. Later that summer, it was blueberry boy bait, a cake so decadent and buttery I briefly questioned if it had too much butter, then checked my pulse, realized any talk of too much butter was simply madness, and enjoyed the cake thoroughly for as long as the blueberries lasted. (Also, it worked.) Last year I become enamored with something I called a strawberry summer cake. Round and finely crumbed, yet almost butter-slathered-hot-biscuit in texture, it works best with just-picked and borderline-overripe strawberries that, when baked, nearly dissolve into jammy puddles throughout the cake. I also found that I liked it with some of the regular flour replaced with barley flour; just trust me, it works. And even though this category of cakes — the ones that you start baking on repeat over Memorial Day weekend (right after you take the cover of the grill and the tags off the season’s first sundress), and tuck away for the winter when apples emerge after Labor Day — was at capacity, that the cakes listed above are really all anyone should ever need, I have never known when to leave well enough alone and I’m so glad because this rhubarb snacking cake is my absolute favorite yet. Case closed. At least until next summer. Because this cake, it simply wins. Part buckle, part streusel cake and part crumb bar, it’s the kind of nubby cake you serve in 2×2-inch squares on napkins, standing in the shade of a backyard. Although only 3/4-inch high, it manages to contain in that diminutive height the three finest elements of simple cakes loudly enough that you won’t even wish it were taller. The base is a thin layer of the most moist, tender and plush yellow cake that has ever graced this URL, fragrant with butter, a bit of lemon zest and the faintest amount of ground ginger. This is followed by a layer of sweet — but not so sweet that it forgets its tart roots — rhubarb that’s been macerated with sugar and lemon and baked into a jammy layer that’s closer to the inside of a crumb bar than the standard handful of berries normally speckled throughout summer cake. It comes thisclose to overwhelming the cake below it, but stops just in time. You won’t mind. The cake is finished with a brown sugar crumble with a pinch of cinnamon and when these three elements bake together, you’re done. You won’t need another go-to dessert recipe this summer, which means that your time is now free to play Frisbee, stare at the deep blue sea, invent cocktails, gather freckles across noses, and drag your sandy, sticky selves back inside at night to sleep soundly, then do it all again tomorrow. This cake was inspired by one I saw in Martha Stewart Living this month, but I changed a lot. Instead of making it in two 9-inch square pans, I baked it in a single 9×13, which is closer to the size I think is fitting for a picnic or pot luck and less work. I 2/3-erd the cake portion, because I wanted it to be thin, skipped the vanilla (which I think can be occasionally clashy with rhubarb) and added a pinch of ginger (which I think goes wonderfully) but not so much that the cake is by any means “gingery.” I increased the baking powder as well, just a hair, because it seemed too little for the flour volume. I didn’t scale down the rhubarb accordingly, but I did add lemon and reduce the sugar because I like it when rhubarb can still shine like its tart little self. I increased the crumb proportionally and I’m glad I did because, really, you can never enough crumb (and once baked, it keeps that extra rhubarb from running right off the cake) and I added a pinch of cinnamon to the crumb because, yes, it’s just happy there. 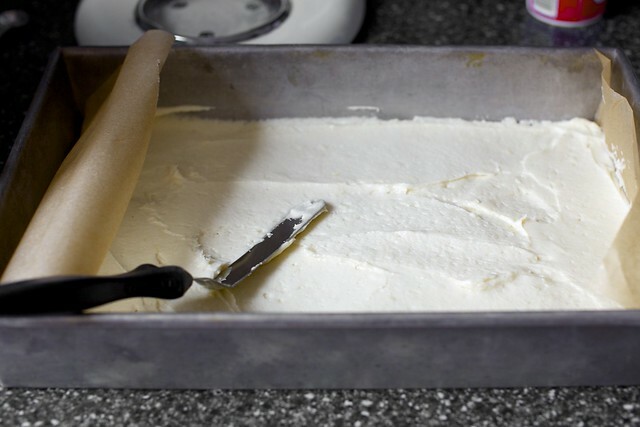 Make the cake: Preheat your oven to 350°F. Coat the bottom and sides of a 9×13-inch baking pan with butter or a nonstick cooking spray, then line the bottom with parchment paper, extending the lengths up two sides. (It will look like a sling). Stir together rhubarb, lemon juice and 2/3 cup sugar and set aside. Beat butter, remaining sugar and lemon zest with an electric mixer until light and fluffy. Add eggs, one at at time, scraping down the sides after each addition. Whisk together flour, baking powder, 3/4 teaspoon table salt and ground ginger together in a small bowl. Add one-third of this mixture to the batter, mixing until just combined. Continue, adding half the sour cream, the second third of the flour mixture, the remaining sour cream, and then the remaining flour mixture, mixing between each addition until just combined. This is my type of pastry and love the idea of swapping out whatever fruit’s in season! Thanks for sharing! OKAY so i just printed out your rhubarb tart recipe.. then you post this! im going shopping soon and now i dont know which to make. which one would you recommend? I think anything with the term “Boy Bait” in it must have been a hit, even if just for the title. I think you should add that to the end of this one, because any sort of crumb cake streusel surely will snag those boys. I know it’d snag my husband for sure. So yep. Rhubarb Snacking Boy Bait Cake. That sort of rolls off the tongue, doesn’t it? Also, perfect timing, as I don’t know much about rhubarb so now this give me an excuse to learn. Thanks! Now I have to go hunt down some rhubarb. And pray that its not crazy expensive. I love summer cakes…probably because there is no frosting involved. I was JUST explaining to my boyfriend over the weekend what a “snacking cake” is, as he’d never heard of it. This is the kind of baking that my mom did in the 70’s and 80’s (simple, no-frills, eat-as-desired kind of desserts), and while I appreciate tackling more elaborate and “fancy” kinds of baking, this is my favorite. Looking forward to making this one, as my farmer’s market is lousy with rhubarb right now. Thanks! I’m not sure whether I’m late to this scene or whether rhubarb seems to be the fashionable fruit of the year! I’ve seen it pop up in so many recipes in magazines and blogs lately. I always assumed it was a bit of a British second rater, but obviously not. It’s great to see it being used in so many ways. Jamie Oliver has two recipes where it’s even used in savoury dishes – one with duck and one with pork. I haven’t tried them yet, but they make sense due to the tart nature of the fruit. Your cake looks wonderful – ready to jump straight off the page. I’m taking a farming class and I’ve been hoarding the rhubarb. No one else gets how great it is. It’s like the acai of the new millenium. I’m going to try this cake – totally up my alley. I disagree with the vanilla/rhubarb clash. If you remember your rhubarb tarts, they have a vanilla bean and the vanilla made the rhubarb so creamy, but still kept the tangy, sharpness. Wonderful counterpoint. I always make your simple summer cake and have been looking forward to what you would come up with this year. It looks delicious! I absolutely love your raspberry, strawberry and blueberry summer cakes – so if you say this is even better, I cannot wait to try it!!! Would you mind adding weights? (I see you’ve already added grams for the butter!) Thanks so much. For the crumb portion: could I replace half the flour with oats? Another use for all my rhubarb, Yum! I can’t wait to try this! One question: any idea how many cups of chopped rhubarb 1-1/4 lbs translates to? I have some from the farmer’s market, but I have no idea how much it weighs and I don’t have a scale at home… thanks! Isnt this a really similar recipe to the big coffee crumb cake? the one with rhubarb? Which do you prefer – am making a tea this weekend and i wanted to make that rhubarb cake but am now stuck for choice. help? Hi Lara — The other cake — and I do realize this is confusing! — is more of a standard, taller coffee cake with a TON of crumb. It’s almost half cake and half crumb. There isn’t as much rhubarb. It’s more like a cake with rhubarb in it and this is a cake that has an almost rhubarb-pie like topping. The crumb layer is thin. Hope that helps. Jenna — No problem! Check back in five minutes. 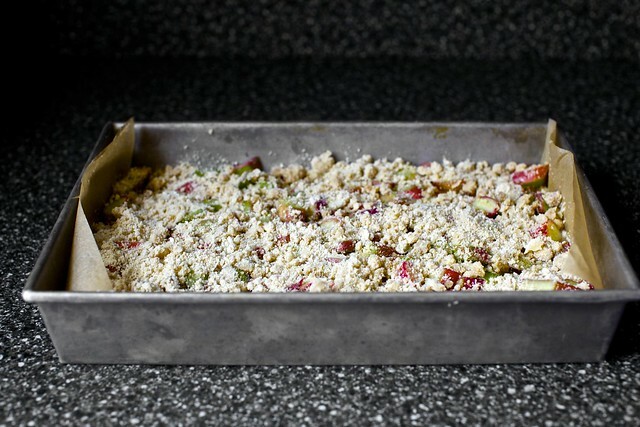 Oh goodness, this is a must make… I made my first rhubarb recipe a couple weeks ago and have been itching to try another. I think this will be it! What a great recipe! This would be perfect for breakfast on-the-go too! Must try! I just yanked a tiny amount of rhubarb from my garden and just came back from the grocery store with 2 more pounds of it to round out my stash. What perfect timing is this to see your recipe. Looks divine! anything with the word “snacking” and “cake” i am into and MUST try! There are just so many good things that can be made with rhubarb! I used what I had for rhubarb ice cream, I must get more rhubarb so I can try this next. I still make your Big Crumb Coffee cake every summer. Some people say it is too tangy, not enough sugar. I love it though. I find so many rhubarb recipes to be overly cloyingly sweet. I actually like rhubarb, so I hate when people try and cover it up with sugar. I say if it isn’t sweet enough, then you don’t really like rhubarb! My rhubarb here in Fairbanks has another week or so to go, but I’m willing to bet this will be the first thing I make when it is ready. Thanks for another rhubarb recipe to add to my collection! 2×2 square!? This looks so good, I think I want to eat half the pan! I need some rhubarb in my life… It’s been too far into spring and I haven’t prepared any yet! This looks completely amazing and I’ve fallen in love with rhubarb this year. Just when I thought I was running out of rhubarb recipes … (should have known better). I ate nearly five pounds by myself last week. (Nigel Slater helped with his rhubarb cinnamon polenta cake.) I’m willing to finish off this whole snacking cake on my own if I have to, as well. I’m rapidly realizing that I did not, in fact, put nearly enough rhubarb in the freezer. Wonder how much more I can pull off my plants! I love rhubarb so much, this looks awesome! I just made your rhubarb muffins last night — YUM! And I love love love your strawberry cake from last year.. so if this is kind of like a marriage of those 2 together, I can’t wait to make it!!!! Yet again, another recipe that I won’t be able to stop thinking about until I get a chance to make it! i am so giddy with excitement because my coworker just brought me some rhubarb from her garden and it’s sitting on my desk! i can totally make this happen! This looks so stunning! You certainly know how to sell a cake! this is exciting! i’ve been making your peach shortbread with rhubarb instead of peach (and loving it!) but am ready for a new spin on my favourite spring/summer treat. I never comment on recipes before I’ve made them, but I must say that this looks absolutely fantastic! I’ve been trying to find a go-to rhubarb cake for years without any great success. This might just be the end of my search! I love your summer cakes. They are all just wonderful. This one looks like it lives up to the high standard. I was just thinking that I needed a desert for a lunch this weekend and lo and behold this post appeared, thanks! I love anything rhubarb. Can’t wait to try this. And I love that shot of the batter and the mixer. THAT is some thick and luscious looking dough! Nice! I have a bunch of fresh rhubarb in the fridge! PERFECT for the super rhubarb baking kick I’m on! I’m expecting 2 pounds of rhubarb in my CSA this week, I’m totally making this cake even though my stupid temporary oven won’t fit the pan. I’ve made all the cakes you mention and blueberry boy bait will always be hard to beat, my husband loves it! the walls of my office are suddenly too confining and all I want to do is run to the store, buy rhubarb, go home, and bake…alas, I need money to buy things at stores, and to make money I must work, therefore I have to stay within these walls for another little while :( that cake would be such a good snack right now! Thank you for the awesome recipe! Hear, hear! Is it terrible that I always make double and keep it in the fridge for sprinkling over yoghurt/ice cream/just eating? What a wonderfull looking cake! We don’t have rhubarb over here – what other fruit can I substiute with? We might have frozen rhubarb – will that do? I love rhubarb so much that I hand-carried the best rhubarb I have ever seen onto the airplane home from Seattle :). The fresh rhubarb we have available to us is sucktastic. Could frozen be substituted? There’s something about the phrase “snacking cake” that I love! I have seen rhubarb over here in Israel. I saw it in winter, not sure you can still get it. I for one am prepared to hunt around – this cake sounds yummy! This recipe looks fantastic! I hope my local market has good rhubarb this week. Last week they only has some very sad looking stalks. You had me when you called a pie a snacking pie! OMG – my husband is going to leave me for you once I make this. By the way, I was making your banana bread last night after notcing 4 brown bananas on the counter and told my hubby I had not changed the recipe at all. He gave me a stare and said it was impossible, I simply cannot stick to any recipe….it is compulsive….unless it is yours. I told him I know you have done the work for me: read a few Epicurious recipes, read a few hundreds comments, tweaked and changed and finally published the best version. You saved me all the work! I saw the same cake in Martha Stewart but it didn’t grab me enough to bother ripping out the recipe page. Now I’m glad I saved my rhubarb for this (improved) version. I think it’s the lemon in with the rhubarb that has my tastebuds interested. I love a snacking cake! Yay for more crumbs, too – you can never have enough crumbs! I will duck in advance if every rhubarb-loving commenter decides to throw whatever is handy at me, but I’ve never fallen in with rhubarb. Perhaps I need to try this version to see if the case has changed, but all the desserts I have eaten with it in the past have been subpar. Which brings me to my question – would an equivalent sub be something with just as much liquid? Like a raspberry, which I am more partial to? I am so jealous! I LOVE rhubarb. Just absolutely love it. Can’t get enough. Unfortunately, I really can’t get enough in California! Farmer’s markets are bare, grocery stores only have a few sorry looking stalks. What gives?? Once I do find some I am definitely making this! Quick question about rhubarb — how do you store it so it doesn’t get wimpy in two days? Not only does the recipe sound delicious, but your prose evokes all the goodness of the season and makes me long for a lazy, summer day. I have a neighbour with a back yard full of neglected rhubarb, and a week or so to fill my freezer with snackable baked goods before I deliver baby #4. This cake is so happening (possibly in triplicate). Thank you! A “crumb” anything will get the crowd goin’. You had me at ‘rhubarb snacking cake’. It’s all I can do not to stick my finger into the screen to get a lick of the unbaked batter! It is weird that that’s what I really want rather than the finished product? It looks so lovely and thick while still being light! Mmm this looks delicious! I love rhubarb, and I love the topping you did! I’ve been seeing rhubarb at the grocery store and truthfully have never made anything with it. I’m so excited to try it out! Your cake looks phenomenal…perfectly fluffy, moist and sweet. Looking forward to giving your recipe a go! I will go to the store. No. Run! To buy rhubarb for this cake. It looks and sounds amazing. We have your Blueberry Boy Bait in our rotation. It seems to come up every time we just don’t know what to bake. I look forward to trying this summer cake and the others mentioned above. Thank you for sharing your recipes! Hi Deb, thanks for another tasty looking cake recipe!! keep em coming!! :) I am not a fan of sour stuff, so was wondering whether it would be possible to replace the rhubarb with another fruit – would you recommend one? blueberries? or blackberries? Replacing the rhubarb with other fruit — I’d say just about anything would work. Personally, I don’t think I’d be terribly into blackberries or raspberries because the seeds annoy me when they’re baked, but you’re of course not making this for me, but you, and can use anything you like. :) Peaches or apricots would be great too. I’d cut any larger fruit into 1/2-inch chunks so it can really bake down. Cake? For snacking? What a perfect description of what I want in my life every day. Now to get my hands on some rhubarb. Saturday is a long time away! Wonderful. When your CSA sends rhubarb, it’s smitten kitchen to the rescue! 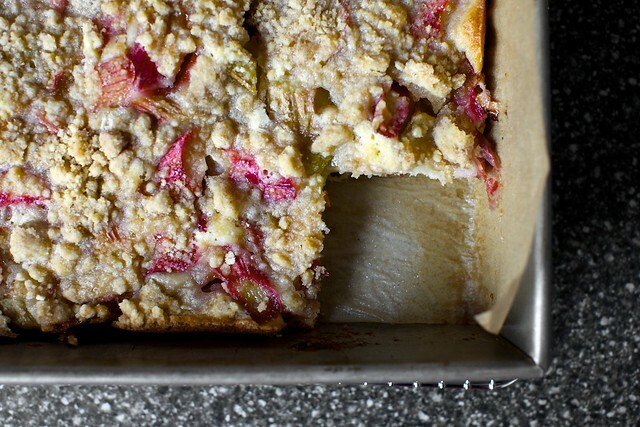 Or, when life gives you rhubarb, make rhubarb snacking cake. I’m going to try this out tonight! Cool!!! The cake really looks so delicious. This recipe can help being more innovative and usage of other fruits can also be tried. I just had to read this when I saw that it was called ‘snacking cake’. So fitting. Snacking cakes are wonderful. They don’t require a frosting, which is a big time saver. They’re perfect for when you want a little sum’p sum’p sweet. I’ve made the strawberry summer cake and raspberry buttermilk cakes so many times. They are my go-to cakes. Both are easy and delicious. Do you think some strawberries mixed in with the rhubarb would work? I can hardly wait to make this for the next potluck. This cake looks gorgeous. I will be making it immediately and on repeat. This is my favorite time of year, when rhubarb comes into season. I always chop loads of it to freeze and use all year round but it is best when it is fresh. I also missed your blueberry boy bait and now I am tempted to make that this weekend as well. I have poor self-control. This will be made tomorrow, even though I don’t lemons to zest in the house. I simply can’t wait till after my weekly grocery trip to make it! It looks amazing. Oh! MY! OH! MY! This is such a devine little snack cake! Love it thanks Deb! i made up almost this exact recipe (ginger included) when looking for something to do with a bundle of rhubard a couple of weeks ago. how i know i have been reading sk long enough that i have begun to turn into you. yay! This post made me sad, because I no longer live upstairs from my best friend, and therefore cannot whip this together just in time for True Blood/Game of Thrones/Whatever, and then demolish it with her in one sitting the way we did with the raspberry/strawberry/blueberry cakes. But I shall bravely carry on and try this anyway. I often make a sour cream pound cake to serve with seasonal fruit topped with creme fraiche. Grand Marnier goes with any fruit so nicely! Yes! I’ve been waiting for this summer’s everyday cake. This is my favorite thing to bake, especially the Raspberry buttermilk cake. Anyone who hasn’t made an everyday cake needs to soften some butter and scrounge up some berries real quick. Any dessert with fruit, streusel, and butter cake wins, especially when it calls for rhubarb. Will make this cake, will fall in love. Promise. Oh why didn’t you post this before Memorial Day! I would have made it! :) Thanks for the great looking cake! I was inspired to try the barley flour when you wrote about it and have been habitually replacing a portion of AP flour with it when I bake. It’s great in lemon squares, scones, chocolate chip cookies, and the pat in peach tart crust Amanda Hesser wrote about in Cooking for Mr. Latte. Made this tonight … Amazing. Thanks again! So, if I make this and your rhubarb streusel muffins (my favorite! ), I can eat rhubarb-streuselly goodness morning, noon and night this summer? Yessss! Yum! Cake is the only way I like rhubarb. Must try this! This bad boy is coming out of the oven in five minutes. If the finished product is anything near as good as the batter (yes, I did have to use a smaller pan since I ate heaps of it) then OHHHHH! This, sadly, was my first official non-box-cake mix, and I am never going back. Thanks, Deb! Would a Pyrex 9×13 work for this? I vow to make this as soon as I return from the JCK jewelry convention next week! Once all the couture diamonds and gems are blogged I will go into whimsical culinary wife mode! Wow! I made a straight up rhubarb pie a couple of weekends ago, then some just barely sweet stewed rhubarb with vanilla bean (on my blog!) and now I’m going to need to get my hands on more rhubarb and make this cake! I made your strawberry summer cake a zillion times last year, I can already tell this’ll be this summer’s go-to cake. Thanks for another amazing recipe! I’m always scared when it comes to rhubarb. I never buy it because I know I will leave in the fridge until it will turn bad and I will have to eventually to throw it away. Maybe if I manage to bake this cake I will make a new friend (i.e., rhubarb)? I must have made your strawberry summer cake ten times so far…thank you. Actually i made lately few times rhubarb cake based exactly on you Russian sharlotca recipe – both with apples and without – good results every time – test even better if left for one day in fridge. So today is baking day. A new summer cake! (I made the strawberry summer cake A LOT last year. And so did everybody who had some…) AND you added grams and such. Thank you, thank you, thank you!!! Deb, this looks great! I love rhubarb. On another note; I love how well you write! I do a lot of editing, and to see someone write so beautifully without the constant interruption of spelling, grammar, and punctuation mistakes really makes your blog, which is already so wonderful (the recipes! the photography! the adorable little boy!) even more admirable. I can’t wait to see the book! It will be, without a doubt, the most riveting (yes, riveting) cookbook I purchase. I have never been this pumped for the release of a cookbook. Thanks again, you taught me how to cook. I just made this tonight. There was none of this “cool completely in the pan” thing happening. We scoffed it straight out of the oven with ice cream and it was beautiful! I usually am disappointed in the amount of fruit I can find in a cake but I love that you have that thick layer of rhubarb! I love the 2nd picture of the rhubarb stalks – the light and colors are just right. :) Also, all the wonderful writing in this post is making me long for the beach! I’ll settle for the next best thing, the park (here in Paris)! I have to make this tonight!! we have a huge rhubarb in the garden, just waiting to be turned into yummy food! Rhubarb? And cake? And crumble? All in one? Yes please! Will definitely try this one as soon as I find rhubarb in France. This looks amazing! I love pairing tart rhubarb into something sweet and homey. I can see why you love a simple cake like this, definitely making it soon!! I don’t know anything about rhubarb. How do you tell if it is ripe? Are the reddish stalks better than the green? Are the green ripe? I want to know so that I can have a little clue about what to buy at the farmers’ market. * Both the red and greenish-white portions of the stem taste the same—tart and tangy. * I generally look for stalks that are 50% red, but no reason to reject yours if they are not. * Ideally, rhubarb should be firm and crisp, like an apple. * Store it wrapped in the fridge, but best to use it sooner as it will be a bit less crisp each day. * You can freeze it, but keep in mind that the cell walls will burst and when it defrosts, like many frozen fruits (though rhubarb is, in fact, a vegetable) it will be soft and slumpy. If you chop it and freeze it on a tray, then toss it into a freezer bag, it will keep for up to a year (longer if you trust your freezer). Use it in recipes still frozen. It will defrost quickly in the oven/batter. smg — Sure. I have read that when baking in a glass dish rather than a metal one, you should reduce the temperature by 25 degrees. Thanks for the recipe–it looks wonderful and I’m going to make it for Sabbath this week. Just one question– it always beats me why any recipe featuring rhubarb also calls for lemon. Any ideas on that? I never use it, but maybe I should! What am I missing here? I have to say, I’ve never eaten rhubarb, but I’ve seen it lately in the store and wished for a recipe to try it. Now I have one and will be cooking this soon! Thanks! 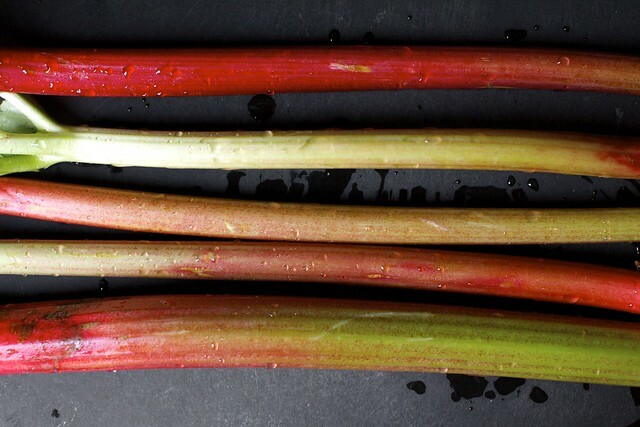 @Katie… There are a couple of different kinds of rhubarb….one is greener in color while the other has redder stalks. (is “redder” a word?) At any rate, when the stalks come up out of the ground, they are ready to use and do not need to “ripen” as with other vegetables or fruits. Whatever they are selling at market will be ready to use. It is best to use the younger stalks, but I don’t know how one could differentiate between younger and older. Many of my fresh, young rhubarb stalks are large; others smaller in circumference so size does not appear to make the difference. The center stalks are larger while the outer stalks smaller around. The stalks should be stiff and not wilted. Thanks! I didn’t have a clue. The only way that I have ever had rhubarb (a long time ago) was in a strawberry-rhubarb sauce on ice cream. At the time, I sort of remember that it was a bit sour. The ice cream was needed to sweeten it up. I never leave a comment but have been reading this blog for a while now. This looks delicious! I hope to try it soon! Try substituting the cinnamon in the topping with cardamom. Mmmm. Happy summer from cloudy, cold Wisconsin. This recipe made even my toes feel warm. I made the cake last night. I waited until bringing it to school this morning to try it. It was AMAZING. I was afraid that the amound of rhubarb was too much. But of course, it cooked down beautifully. Many of my students and colleagues had never even heard of rhubarb! I was happy to use your cake as an introduction. I love anything named “snack cake”, can’t wait to use up my summer fruits this way. This cake is beautiful, and your description of each individual layer made me pretty desperate for the next cookout/event/rainy night as the perfect excuse to bake this cake! Sounds incredibly delicious. Guys, sorry for the downtime today. I used it to buy a newer, bigger server and, fingers crossed, by the end of the week SK should be loading like new again. Hi karla — No such thing dumb questions! (It’s not like a photo will tell you how it tastes, anyway.) When raw, it’s crisp like an apple or celery stalk, and very sour. If you were to saute it in a savory dish without sugar, it would add an acidity or almost lemony element. Even though it looks very stringy and fibrous, there’s no reason to peel it. When it cooks down, it completely falls apart and the strings break down. It cooks down fairly quickly. If you were making a compote with rhubarb, sugar, and water, it would be fully soft in just about 20 minutes. This is why it’s so wonderful for tarts and pies and jams. Let’s see, what else: The flavor is a cross between a berry or cherry and lemon, which is why it’s so good in desserts. It adds a balance of tartness that’s hard to get when you start with a fruit that’s already sweet. Also, t’s actually a vegetable, not a fruit, but in cooking, it works so much better with fruits (imho). The leaves are poisonous (though if you buy it at a store or farmer’s market, you’ll never see them and if you grow it, you probably know this!) so you’re kind of living on the edge when you eat it. I am ashamed to admit this, but I was 50 years old before I ever tasted Ruhbarb. I live in the deep south, and ruhbarb just wasn’t something we saw much of. All of a sudden it became popular in my neck of the coast, and I decided to give it a try. Oh my Lordy, it was love at first bite! I have been trying to make up for all those lost years ever since. Thanks for the tips on buying. I’ll be putting those tips to good use this afternoon at our handy dandy Publix Market. I plan to make your cake this evening. And, right after I do, I am headed to Amazon to pre-order your book. I love your web site Deb. Thanks ever so much for experimenting on our behalf! This past weekend I made the strawberry rhubarb crumble. As I was reading this recipe I wondered to myself how long ago you posted that one – 2 years? And there it was 5 years ago! I make that recipe non-stop at the start of summer. It rocks. Although you may have convinced me to give this one a try. 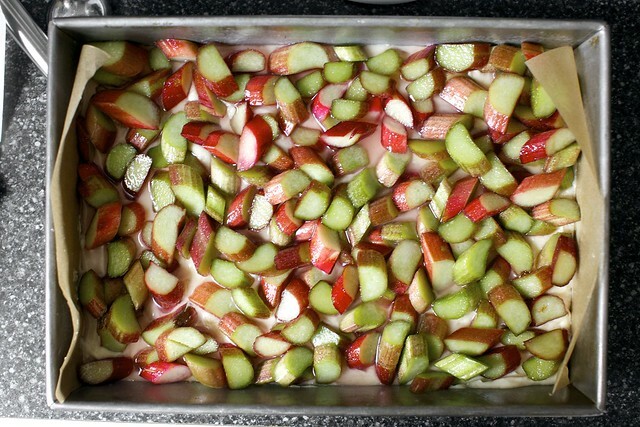 This is in my oven right now…I subbed strawberries for a third of the rhubarb. Can’t wait to eat it. The cake batter smelled so good that I might just make a plain cake out of it some time! Oh my, this sounds absolutely wonderful. I have an obsession with rhubarb that began during my childhood. My German grandmother made so many desserts with rhubarb – kuchen, snack cakes, crisps, pies, you name it. She would also allow the rhubarb to shine by not over-sweetening it. This dessert sounds like a wonderful homage to my grandma. In my opinion, rhubarb is the most gloriously undervalued and overlooked fruit/vegetable. And for another rhubarb inspired dessert – last year I made a rhubarb swirled cheesecake. The tang of the cheesecake (with lots of lemon zest) and rhubarb play very nicely together! Oh my goodness, this sounds perfect! We’re now eating dairy-free at our house, but I don’t have much baking experience yet. Does anyone have any suggestions? Thanks for the warning on the poisonous leaves! I’m growing rhubarb for the first time this season, and I had no idea. Here in Northern California, we get a lot more plums than rhubarb, so I expect I’ll be making this with plums, as soon as they start falling in a couple weeks, and which I think are the closest fruit to rhubarb, in terms of tart/sweet. Woohoo! Yum, yum, Deb! I made this last night right after I saw this post (I’m preggo right now and I’ve had a major hankering for something rhubarb-related). :) My husband and I had a piece right out of the oven last night with some vanilla ice cream, and then I brought it to work and shared it as a “coffee cake” this morning for a meeting. It was a hit! My husband and I were so excited to make this last night, but when I ran out in the backyard to harvest some rhubarb, I realized we only had 1/3 of what we needed! So we subbed strawberries for the rest of the weight, cut back the sugar a bit to compensate for the sweetness of the strawberries, and it was SUPERB! Thanks Deb, for another great recipe. I discovered your site a few months ago and I am obsessed with your recipes! Can’t wait for the cookbook to come out! I just made this today , and , at 37 weeks pregnant, I should be making stews and soups and easy things to heat and eat, but all I want to do is to make this cake again. I wonder how it freezes? Perhaps because of the long baking time the baby will nurse, get changed and fall asleep before the buzzer goes off?! Wishful thinking but thanks for this delicious recipe! Wow. Perfect. Absolutely perfect rhubarb cake-thingy! I’ve been looking for this one for years… Thank you, Deb! I want to make this cake with something other than rhubarb. I don’t like rhubarb, it is not in season in this part of the world, and it’s too sour. That means it needs too much sugar to make it palatable. Please suggest another fruit that would work with the ginger and suggest the a reasonable reduction of sugar. Just made your Rhubarb Crumb Cake over the weekend. An annual event — such a winner. Your rhubarb muffins (also recently made) have white whole wheat or whole wheat pastry flour. I think that would work in this cake too, making it even more “snacking” friendly. I appreciate the lineage of this cake to your other simple summer cakes. I made the strawberry summer cake several times last year (once with wineberries and a few times with raspberries). But I want to also mention another top fave: Raspberry Breakfast Bars. Those were so amazingly good I couldn’t believe it. I will certainly be making this rhubarb cake, as soon as I can snag some rhubarb. This post was signaturely ‘Deb’. I loved it. And Rhubarb is my all-time favorite… fruit? vegetable? …hold on… I’m back. “Rhubarb is usually considered to be a vegetable; however, in the United States, a New York court decided in 1947 that since it was used in the United States as a fruit, it was to be counted as a fruit for the purposes of regulations and duties.” -thanks, wikipedia! Other fruit suggestions: Strawberries could be great, peaches and plums too. Hard to estimate the amount you’ll need but you’re looking for an amount that when chopped (again, 1/2-inch pieces) will fully cover the top of the cake in one layer. The sugar should only need to be dialed back slightly, maybe using a 1/2 cup. The rhubarb layer here is fairly tart, still. You read my mind! My pregnant belly has been craving something rhubarb-y, but I couldn’t quite decide what it was I wanted. This is it!! I’m absolutely making this this weekend. Thank you! could you also put in volume amounts for the rhubarb – like 2 C cut up? I’m picking from my garden and don’t use a scale. otherwise – this looks delish and I am definitely making it this week. thanks for another winner. This is a great recipe. I just got some lovely rhubarb the other day so I will be making this soon. I also want to say I really love your blog and look forward to a new post as I really adore your writing. Thanks. I made this tonight, and it was delicious: super “snackable”, not too sweet, and delightfully summery. Oh, and the splendid result was despite not knowing how much rhubarb I had. I just chopped it up and figured if it looked close to the photo (very handy guideline, that!) that the cake would at least be passable. Yup. I just made this and had a slice, and it was amazing! I’ve never cooked with rhubarb before, but it was super simple. I made it in two 9″ round cake pans, one for me, and one for a small party. I’m glad I don’t have a 9×13 or else I would have to give away all of it! This looks absolutely wonderful! 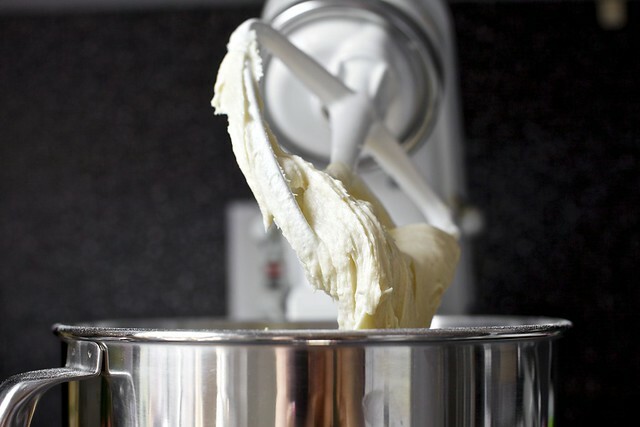 I love the picture of the batter dripping off the mixer. Positively delightful. Tempted to make this with plums later this year. This cake looks amazing, I love how you mix the sponge and the crumble topping. I am a huge rhubarb-aholic too! I bought 2lbs of rhubarb at the market with the intention of making jam and was given two bunches, neither of which weighed in at more than 12oz – while I don’t get angry at my farmers, I admit that I felt a bit cheated. Luckily there was just enough to make some delicious cake! Thanks for the perfectly timed recipe, Deb! This is the cake base I’ve been looking for forever, I hope. I have an apple dessert that uses a cake mix as the base and though the dessert is decent, it would be outstanding with a less artificially flavored base. It’s the only time I’ve ever resorted to using a cake mix and only because I had no cakey textured base recipe that I could sub. I’ve had only one experience with rhubarb and it wasn’t very good..but I blame the strawberries that practically melted in the mixture that ruined my pie but made excellent jam when drained into a pot and cooked down on the stove. Rhubarb is hard to come by in CA. Mostly it’s fairly limp when you find it. I’ll be picky this time around. 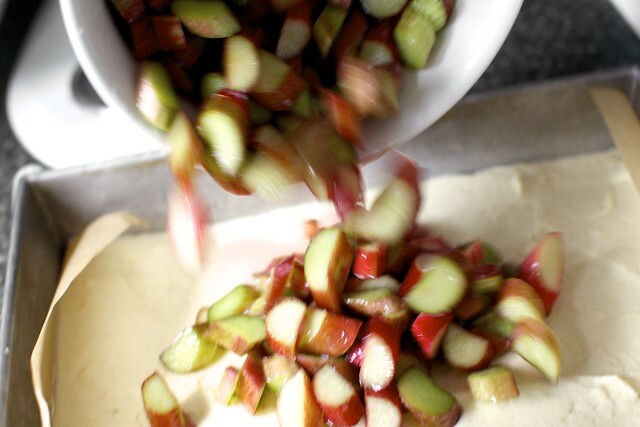 I needed a dessert recipe and was planning on rhubarb something since it is in abundance in my kitchen at the moment. Then you published this like it was meant to be. I will be making this tonight – hoping to impress some colleagues with this, thank you so much!! I trust you on this one because that Strawberry Cake was so amazing (like I said previously). I’ve never used Rhubarb before so no time like the present! This looks awesome. I tried and failed to make a strawberry-rhubarb bundt cake two summers ago, the only cake that I have ever made that was unedible and I actually threw it away. It could have been that it was the last week of July and we had no a/c, but I’ll never know. This looks like just the cake to get me back on my feet again. And who doesn’t love rhubarb? I’ve seen it actually grow in Wyoming, I might have to plant my own. The recipe sounds wonderful. What could I replace the sour cream with, for a dairy-free version? Helen — I haven’t worked with soy yogurt before, but that would be my first stop if you’ve replaced it successfully in other recipes. Soy milk would probably work as well, and you can “sour” it a little with lemon juice. I have yet to get on the rhubarb train this spring, but after seeing this cake, I realized it’s not too late if I run…. I’m glad this cake allows the tartness of the rhubarb to shine! Another good replacement for the sour cream: silken tofu? Deb – if you like the court ruling on rhubarb you’ll love this one! Thanks for the spring time recipe Deb! I have been trying to make something with rhubarb every week while it’s the season. And believe it or not, I’m actually getting tired of eating rhubarb pie (although no one should ever get tired of pie), so the snacking cake was a great change of pace. Looking forward to trying the rhubarb crumb cake! Did anyone else have trouble with the crumb portion? I found that the cake baked faster, leaving me with a raw and floury tasting crumb. I tried broiling it for a bit which helped, but it certainly didn’t look as delicious and crumby as yours. Made it today for happy hour at our house (casual, impromptu, come drink beer eat snacks at our place before the toddlers melt into puddles of exhaustion). It was a hit. I did sub in whole wheat pastry flour and it worked just fine (I think the slight increase in heartiness does well with rhubarb). Also, I chopped up and macerated the rhubarb for several hours…which I think balanced out the slightly drier batter of the whole wheat flour (because the rhubarb released more liquid). All in all, awesome! Just followed your instructions to eat a piece standing up. wonderful. Thank you!! Mmmm! Planning on trying lots of ways to make rhubarb pie. This way will definitely be one of the recipes! Thank You! always made. Your’s are always so yummy. Thanks so very much! This is excellent for the summer. It is fast and easy to make. Ideal for those day that your very excited to go out on a picnic or to the beach. It’s Most famous cake in Vienna. And of Course i Love it. My Oma and her mother used to make a cake almost exactly like this. I make it now. And it is amazing. I wanted to make something with rhubarb, since it just began appearing here and there… I looked through countless recipes — no, really! I had enough of rhubarb fool, and I’m not yet there for canning (hey, I’m 16, I’ve got time! [and an irrational fear of rubber taste]) And when I finally settled for this: http://notwithoutsalt.com/2012/03/28/rhubarb-cake/ , you are posting THIS! Now guess, which cake is now cooling in its pan, huh? Smells heavenly, minus ginger, which I forgot to buy. The rhubarb was rather juicy when I put it on the cake, but it seems okay now. Streusel all the way! This is fabulous! I have lots of rhubarb in the freezer and a bit left in the patch. I’ll definitely be baking cake this weekend. You did it again Deb! I was searching for a new recipe that softly showcased rhubarb and this was just perfect!! The cake is not overly sweet, the thin layer of rhubarb and crumb pulled everything together! It goes perfectly with my morning coffee! Thanks for sharing! This was so good. I made a half batch with yogurt instead of sour cream (because we didn’t have any sour cream and we only had about half the rhubarb in the recipe. And no potlucks on the horizon.). A-freaking-awesome. I could probably eat the whole batch myself but I’m holding back. Barely. This looks wonderful! Just got my first batch of rhubarb in our CSA and I’m making this tonight. Just wondering, could the final product be frozen? Ironically, I also went out today (before I knew I was getting rhubarb) and got raspberries to make your raspberry buttermilk cake. :) I want to make both before the fruit goes bad. I was thinking I could bake it, cool it and then freeze individual squares? Excited to try it as the raspberry buttermilk cake is my go to cake in the spring and summer for brunches and cook outs. It is so well loved in my house. This was FAB! The only things I did differently were: I added nutmeg to the rhubarb while it was macerating, and I substituted plain yogurt for the sour cream as I had none in my fridge. Sometimes I make stewed rhubarb with candied ginger, sugar and lemon zest, just as one would make apple sauce, and serve it with pork. My first rhubarb memory was having Ftatateeta’s French toast with cream cheese and rhubarb/ginger jam at Serendipity c. 1961. Long time reader, first time poster. I substituted gluten-free flour here, but otherwise made it as written. It worked just fine. I think that the crumb layer would have benefited from using oat flour rather than GF, but it’s a great cake, and something to do with the rhubarb plant in the backyard. Thanks! Great photos and it really makes me want to try this yummy recipe. I have fond memories of rhubarb pie that my grandfather loved. I will have to try it! I MADE THIS CAKE!! (No offense but it drives me crazy to have to sift through dozens of “this sounds amazing” or “I have to make this” or the worst “this smells great while it’s baking”). Why can’t folks make it THEN tell us what they think? SO! It DID smell great as it baked, BUT it’s very tasty too. I only wish I’d doubled the streusel as the rhubarb/lemon combo makes it quite tart. I did use greek yogurt instead of the sour cream and vanilla instead of the ginger. (Yes, I’m sure some will tell me they hate people who make a different recipe.) Thank you for a great seasonal treat! thanks for another fantastic way to eat rhubarb! For anyone interested in halving the recipe, I made this cake very successfully in an 8×8 square pan. The only problem is that my husband has just gone back for his third piece – maybe I should have made the full recipe. I used plain whole milk yogurt in place of sour cream and it worked just dandy! They’re pretty much the same thing, anyhow. Also, you already reduced the sugar!? Maybe it is just me, but this is still super sweet. I think it could be cut down to a cup or less of sugar and still be absolutely delicious! Coconut variation: I added about half a cup unsweetened flaked coconut (roughly chopped–they were the super thick kind) into the batter and subbed in coconut oil for half the butter in the cake. The coconut rhubarb combination is sublime!! most definitely making this today! Thanks bunch for this delicious recipe! It is one of three new rhubarb cake recipes I have tried this season, and it was an instant hit with my family! It is not as “cakey” as many others, the cake layer really only supports the rhubarb and crunchy topping – heavenly! At first I thought it might have been a bit too much rhubarb because the top was fairly… well… soupy while baking, but it all came down to a moist cake, a creamy fruit top and the yummiest bit of caramelized sugar around the edges. I must admit I’d never have thought a pinch of ginger and some lemon zest would team up so nicely with the rhubarb, but lo and behold! I am converted. Also the total amount is perfect, just as you say above. We’re a family of three (with a kid aged 3) and will just manage the cake over a weekend without too much of a bad conscience. The absolutely only thing I changed: I lined the tin with parchment paper on all four sides, partly also because I only had a stainless steel tine on hand, nothing with a no-stick coating, and highly recommend this because getting the cake out of the tin is definitely easier this way. I’m getting all restless now to try out the raspberry buttermilk cake, the blueberry boy bait and the strawberry summer cake… total cakemania! It’s perfect summer cake. Good-bye chocolate and hello fruit. I’m going to try making this today. Hope it goes well! I made this cake yesterday, and wow !! served it warm, with some strawberry ice cream, delicious ! This was a hit-super easy and delicious. I tossed in about 2 tbsp apple brandy to the rhubarb. Mmmm. Tried this recipe and didn’t love it. The sugar and juice from the rhubarb seeped to the bottom of the cake and made a sticky, hard bottom (almost like a hard candy) that sort of ruined the experience. But I usually love your recipes, Deb! Hi Megan — Sorry it didn’t work out. A hard bottom doesn’t sound right at all. It’s a very tender cake. I wish I understood how that might have happened. Did you use a glass baking pan or anything unusual? Thanks. Hi Deb – I’ve got barley flour left over from the strawberry cake last summer! Do you think this one would benefit from replacing some of the regular flour with it as well? This is wonderful. I was expecting to have plenty of left overs but that didn’t happen. I will make this again and again! Thank you! This cake is delicious, thanks for the recipe! I am always a bit confused about how much of the liquid to include after macerating fruit for a pie or for a recipe like this. I did add some of the liquid that came out of the rhubarb, but I left out a little more than half of a cup. I was worried about the cake getting too wet, but the rhubarb layer also didn’t come out totally jam-like. Should I have added all of the liquid? Hi Kate — I added all of it. It leads to the longer baking time but also a very moist and flavorful cake. For those of us who don’t have a scale…How many cups is 1 1/4 lbs. chopped rhubarb. Thanks! New trick: Share Smitten Kitchen recipe on Facebook. My mom of course sees this and makes the rhubarb cake. Yahoo! No work, all the benefits for me! Such a nice cake. The whole family loved it. I have a question:) When I added the sugar and lemon juice to the rhubarb and let it sit for a while, I wound up with a fair amount of liquid at the bottom of the bowl. Did you use that liquid when you put the rhubarb layer on the cake or did you only use the fruit? Deb…one more question. After you’ve made the cake (let’s say at night) do you put plastic over it to store or do you keep it unwrapped. I’m afraid that covering it will make it too gooey but I don’t want to dry it out. I’m always wondering how to store. It is delicious….Made it twice already! This was great! I left some at a friend’s house. They later called to tell me they felt like a kid again coming home to a piece of cake…. :) Always great to make people happy! The power of butter, sugar and flour! Oh yes. i will be getting some rhubarb today, and making this tonight. i LOVE rhubarb. and i’ve not had a cake like this yet. how did i live this long without it? thanks!! SO good. I used a glass pan as well and heated the oven to 325 degrees. I also didn’t realize until I started the recipe that I had no ground ginger, but I used a little bit of fresh, and it definitely works with the rhubarb. I love that the rhubarb is still a bit sour and not complete mush after baking. Also, I agree that the cake is ridiculously moist and flavorful! I will have to bring this to work to get rid of it because I could probably eat it all myself. I substituted low-fat yogurt for the sour cream, olive oil for the butter, and white whole-wheat flour. Delicious! I made this yesterday and it received rave reviews! I too used a glass baking dish and the cake was moist and tender on the bottom. The use of the parchment paper sling is helpful. This is a perfect company dessert as well, I think. No muss, no fuss! Hi there, My husband and I could not remember any rhubarb taste experiences (we are middle-aged after all). Anyway I made this and we found out that rhubarb is a delicious tart sensation. The cake and crumb are a wonderful balance to the tart. Thanks for posting this cake recipe! @Sarah 214 – My fella cut the rhubarb up for me and measured it. It came out to just about 4 cups even, cut the way Deb says to – 1/2-inch pieces cut on the diagonal. Thanks Deb, I can’t wait to try this. I love rhubarb and recently made a new favourite to take in to work – Rhubarb, Sour Cream and Cinnamon Sugar cake from Belinda Jeffery’s Country Cookbook. I was shocked that so many people had never tried rhubarb or only in pies with strawberries. 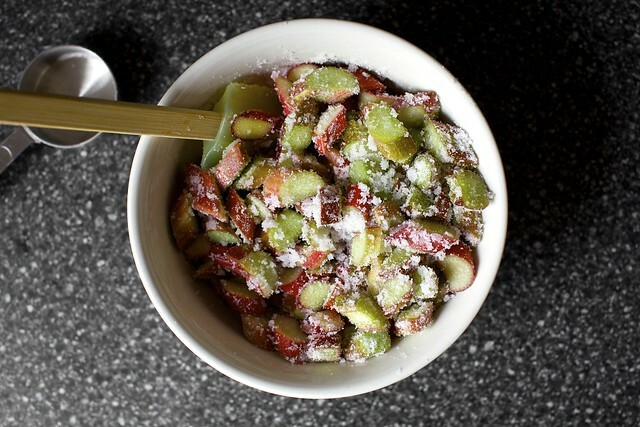 One question – can substitute apple for rhubarb in your recipe for more finnicky eaters? I made this last night using orange zest and juice—–it was wonderful. please try it with orange next time. and vanilla was quite yummy in this. I tried it this weekend, with frozen hrubarb and added some strawberries and apple, because I was a bit short on rhubarb. What a delicious cake! It is something to make again and again. And when the rhubarb season is over, I will simply use plumbs. I actually found the cake to be a little underwhelming, especially during the first couple bites. As time/pieces went on/were consumed, I liked it more. I did appreciate how the rhubarb really is able to shine ‘like it’s tart little self’ and loved that my teeth found a small piece of lemon zest during the feeding. Like a few others in Comments, I’ve eaten (and loved) rhubarb my entire life. Here in the Pacific Northwest rhubarb grows wild. My German mother (someone else here mentioned their German grandmother making rhubarb treats) used to make rhubarb “stew.” Cut it up, add a little water and enough sugar to make it edible, cook it down until it reminds you a bit of homemade applesauce and it’s dessert. One thing I haven’t seen mentioned is rhubarb’s health attributes…it’s loaded with vitamin C. On the other hand, there is all that sugar…. This recipe looks delicious, and I’ll make it this weekend. I made this cake last night….AMAZING!!! However, kept it on the counter in a sealed container and the crumb got pretty soggy overnight. I was thinking maybe I could put it under the broiler for a few minutes to crisp it up before eating tomorrow? Did this happen to yours? Otherwise, so delicious!!! Bethany — I do think you could toast it back up in the oven. It’s unfortunate, but those moist cakes and tender cookies we all love totally lose their crisp edges when in an airtight container. The other option is to refrigerate the cake (I think I did this); it won’t get as soft and it shouldn’t dry it out the way the fridge does many other cakes because the cake is so crazy moist to begin with. You can also leave it loosely covered at room temperature. I made this one day before bringing it to a barbeque, and it was super delicious. I didn’t have sour cream so I swapped it for yoghurt. I know you aren’t a fan of cardamom, but I couldn’t help myself so I swapped it for the cinnamon. What impressed me most about the cake was the slight caramelizing of the crumb at the edges due to the long cooking time. I have one theory as to what might have happened to Megan (comment 208), if something goes wrong when you add the eggs to the butter and sugar the batter will be too thin and not viscous enough to keep the rhubarb juices to seep down. If the parchment isn’t secured to the dish with butter that could also be it. I think you have a typo at the end of the recipe. It says ” and eat the first one standing up” I think you meant to say “eat at least two standing up” :)) heavenly! Thank you! I’m not really a fan of rhubarb, but I made this cake for a friend and it was amazing! Thanks for helping me take my baking to the next level! I can’t wait for your book. Made this cake yesterday evening. Delicious with a dollop of whipped cream. I’m gonna serve this tonight to my girlfriends. Next time I may add some strawberries and cut the amount of sugar in the cake batter. Just finishing my first bite of these cake. I made half recipe in an 8×8 pan; I used greek yogurt instead of sour and reduced the sugar, for the crumbs I used ground oats and a little flour. It tastes great and the house is smelling wonderful! I made this today with rhubarb from my garden and it is delicious! I just made this and it is unbelievably good. The ginger is just the right touch! Just made this cake using half rhubarb and half strawberries (reduced the sugar a little because my berries were lovely and sweet)… it is fantastic. Thanx for the great recipe! Just made my cake. it’s still cooling in the pan. I was on my way to make the Martha Stewart grunt when I was happily side tracked online. With luck, you had your own plan. Can’t wait to try. This was so simple to make and absolutely delicious. Thanks (again and again), Deb. I added a pinch of cadamom to the topping and even more lemon zest; I was not unhappy. I also think scrapping the cardamom and the ginger, but adding rosemary and a few pine nuts, might be pretty fun. I skipped the ginger for the eaters but followed everything else exactly, turned out great! Thanks for the recipe! Love rhubarb. I think i didn’t have enough butter for the crumbs on top because I have a white dust covering my snacking cake… does that make sense?? I made this Gluten-Free using Pamela’s baking and pancake mix in place of the flour and leavening and it was spectacular. Even gluten eaters like it. I will say pr-elevened flour makes a mess of the crumb top, but the overall textture and taste was still delicious. If you wanted to make your crumbs stay crumbier, plain almond flour would probably be delicious! Deb – sorry I took a while to respond. I think my mommy brain took over (I have a toddler and am 6 months pregnant – double whammy), and I didn’t even realize until the next day that instead of grabbing my 1/3 cup measuring cup, I grabbed the half cup. I made this cake in a hurry, and I inadvertently messed up all the measurements. No wonder it turned out a little funky! I thought that 1/3 cup looked awfully big. Sorry for the bad review. I do always love your recipes, though! I made this cake last night and wanted to share my experience. It is really good! I loved it and my husband, who thinks there’s basically no reason to ever make a dessert other than brownies from a box, liked it just fine. (That’s a big compliment coming from him.) I think this might be the first time I’ve ever really gotten the true taste of rhubarb in something. Usually in recipes the rhubarb flavor is quite muddled with sugar, spices and/or other fruit. I also love the cake / jammy filling / crumb topping combination. Kinda like the best possible combination of all summer desserts and I can envision a million variations on this concept. My one small issue last night was that my cake was a smidge dry. It needed the dollop of vanilla ice cream that we put on top. (I, for one, love rhubarb + vanilla.) I don’t think it was the recipe, though, I think it was the fact that I’m cooking in a weird little corporate apartment kitchen this summer and don’t have my kitchen scale or my good measuring cups. As a result I think I inadvertently used a bit too much flour. The silver lining to that cloud, however, is that this morning it was perfect! I noticed that at least one other reviewer mentioned that hers was soggy in the morning, but I liked the texture even better this morning. (I just covered it tightly and left on the counter.) So if you are planning for leftovers, you might try adding another 1 Tbsp of flour and see what happens. Thanks for the recipe, Deb! This one is going into regular summer rotation. This cake is so good! Ate the first piece standing as required. It’s going to be a struggle to avoid eating the rest tonight! As per usual-another outstanding recipe! Totally appreciated the directions including eating the first piece standing up :) If anybody is wondering, I used soy sour cream and it came out perfectly. Thank you again – can’t wait for your cookbook! I wait all year for rhubarb. It grows wild in everyones yard here in Juneau. Everyones but mine. I am very picky about what I do with it when I do get my hands on some (bumbleberry pie, strawberry rhubarb pie and strawberry rhubarb jam are my three go-tos). This recipe is being added to the rotation. My son ate three pieces for breakfast and asked for one in his lunch box. ps, you should make some strawberry rhubarb jam so that in the winter you can smear it into layered lemon cake. I made this for Father’s Day. Had some fresh rhubarb left in my garden. It was a HIT!!! Both of my boys (dh and toddler) loved it!!! First time on this website and first recipe from you….thank you very much, highly appreciate it!!! Wow! This looks amazing! Should have seen it before to cook this for my dad! Thanks for sharing, I will keep this recipe preciously! By the way, the pictures look fantastic! Oh maaah gaaah! Thanks again for yet another stellar baking recipe Deb. * Orange for lemon. Simlply because this is what I always pair with rhubarb, no matter what the recipe. * Ground ginger for cinnamon in the crumb. I don’t like cinnamon and rhubarb together. * I also reduced both sugars quite a bit and will again further next time. I love my baked goods, but not real sweet (weird and kinda pointless, I know!). I finally made this – swapped sour cream for lemon yogurt, swapped a third of the flour in both the cake and the crumb for ground almonds, and added a half a cup of chopped almonds to the crumb. The lemon/almond/rhubarb combination is amazing. I make rhubarb crumble all the time but this cake hits a whole new level of wonderfulness. I made a terrible mistake when putting this together. After adding the rhubarb to the top of the cake, I threw out the juices that had formed from the sugar/rhubarb mixture. [When I looked at your picture, I could see the cake batter below the pieces of rhubarb but no juice was visible.] I read about 100 comments before making this cake, but everyone was simply commenting on how good the cake looked and how they were going to make it soon. How I wished I had kept reading to the end before making this cake. A number of readers asked if all the juice should be added, and, of course, you told them yes. So my rhubarb snack cake was somewhat dry, certainly not as moist as it probably should have been. My fault! I’ll check near the end of the comment section from now on to read about those who have actually tried the recipe. Deb, I am so sorry! Can you tell how new I am to this whole recipe trying/recipe commenting scene? I just read your “Comment Guidelines.” You’ve included so many good suggestions. One of the first things you suggest is to go to the end of the comments for reviews by cooks who have actually made the recipe and have shared their changes and tips for a successful outcome or who have questions for you. Next time for sure! In any event, love your website! Why not strawberry rhubarb snacking cake? Came out fantastic. Thank you for all the excellent cooking ideas. Deb – make this cake for my dad/gram on Fathers’ Day, as we are all 3 rhubarb fans. huge hit! thanks for this and all your great recipes. Made this over the weekend and it is delicious! Used some strawberries, since I didn’t have the quantity of rhubarb called for, and that worked just fine. This is a keeper – yum! Oh, I forgot to mention that I subbed white sugar for brown in the topping (I was out) and heavy whipping cream for the sour cream (also out). It’d be even better with the called-for ingredients, I’m sure, but just in case someone wants to make this and doesn’t have those two things – go on anyway. It was delicious! I made this cake tonight for my last dinner with my family in New England before I move to Texas, and it was fantastic!! (as was Ina Garten’s lobster cobb salad we had before it) Moist and perfectly sweet/tart. My parents have a rhubarb plant in their vegetable garden so when this recipe popped up it was perfect! I was a little short on rhubarb, and it could have used more, but I love that it is a great jumping off point for almost any other fruit as people have said above. However I thought the cake was sweet enough that it needed something tart… maybe granny smiths and dial up the cinnamon/ginger in the Fall? For anyone that was asking I made it in a glass dish at 350 for 50 min and it worked great. Froze the leftovers, so I’ll let you know how that works when we bring it back to life. Thanks again for another great recipe! I always go to you for baked goods. This looks stunning. Now I regret not getting some rhubarb at the farmer’s market yesterday while the getting was good. I’ll live, because I’m going to make the chocolate swirls tonight, so I can bake them Saturday morning. Oh and the links to other recipes in the narrative are broken. I just pulled this out of the oven and it’s cooling under a tea towel because I’m going to bed now. I’ll have to wait til tomorrow to try it as it’s really late, but I’m really excited as this is my first foray into rubarb! I just this week (third summer living in this house) that amongst the vines and wildness growing in the neglected bed next to the back fence, there’s some rubarb! It’s not as pretty as yours having very little red, but I’m sure it will taste great. I had some left over crushed hazelnut that I added to the crumb topping. I’ll let you know how that tastes tomorrow. The pictures are what sold me because I’ve never made anything with rhubarb. I was sort of hoping it would be bad so I could take it to work and everybody else could eat it. I was WRONG. It’s very good and even my husband who supposedly doesn’t like rhubarb loved it. The only change I made was using some honey greek yogurt instead of sour cream because that’s what I had. It turned out great! I’ll be making it again this summer! I have just had a sneaky piece – as the recipe suggested! Delicious, not sure the rest are going to last until my colleagues arrive. I added a bit more lemon juice than suggested, as hate to throw things away – makes the sponge like a mini version of a Lemon Drizzle cake – this is definitely going on the make again pile. Especially as I have rampant rhubarb in my garden that keeps growing!! The base cake is really good. Made a rhubarb version a couple weeks ago: delicious. It gets better as it ages, if it makes it that long. Made a strawberry/blueberry version this morning. A 1/3 cup sub of whole wheat flour doesn’t change the consistency/flavor at all. Thanks Deb! Thank you!! Delicious! The cake texture is perfect. It’s not too sweet. The crumble is a great consistency, the rhubarb still tastes like rhubarb, and the lemony, gingery moist cake holds it’s own. Followed the recipe exactly and it came out perfect! You’re the best, Deb! Ok, I’ve never had rhubarb so I was curious, but since it was only available for like 1 week a year for me, and it smelled/looked like celery, I wasn’t expecting to like it. Oh the brilliant know-it-all I was, I threw out the lemon juice/zest 5min before making this cuz I was cleaning the fridge. And since there’s all that juice left from the rhubarb marinate, I mixed it into the crumbs, for which I ran out of butter so I only used 2 tbsp. It was DELICIOUS DELICIOUS DELICIOUS. I’m losing weight and this just ruined 1 week worth of effort but seriously, did I tell you it was delicious? I only wished I had put in 2 lb of rhubarb instead cuz those little sweet puddles are heavenly. I have made this cake, and it is a huge hit in my house. If I am happy to just serve this cake in the pan, may I do away with the parchment paper step? Stephanie — Probably, but it’s also an insurance plan in case the cake doesn’t want to come out easily. If you’re using a coated baking pan (nonstick) or one that’s not terrible old or worn, just buttering it should be enough, however, and you might not need the parchment. This is my new favorite! I sprinkled some strawberries on top and it was even more beautiful. My friends loved that it was called a snacking cake. You’re making me a better cook! I recently had to go gluten-free, so I am more than thrilled that all of your recipes contain weight measurements as it means that I can still make them! (and I don’t have to cancel my cookbook order…*shudder at the thought*) Thank you, thank you!! Since I am an absolute lover of rhubarb, I decided to make these for a work event on Tuesday, and they were absolutely delicious! I loved how balanced all of the flavors were and that you still got that tartness without it being too overpowering. I think the splash of spices enhanced the flavors well without taking over the cake, and I appreciated the tip about rhubarb and vanilla. My sister who has never liked rhubarb came over to visit last night, and about half of my leftovers are gone now, lol. That should tell everyone how good this cake is! So, thank you again for your fabulous recipes and your devotion to weight measurements that you have fought for us over! I have a question about your measurements. When you bake, do you measure or do you weigh your ingredients? I have a different measurement for 1 cup of flour and I’m wondering if I should check again. Hi Karen — I fluff and scoop and level or spoon and level. My cups clock in on the light side (125 grams for all-purpose); you can also estimate 130 grams and the recipe will be fine. Looks good and yummy! Will surely try this! I made this and it is delicious! But all the rhubarb and crumbs sunk to the bottom and the cake batter rose to the top and it was very wet and soggy on the bottom. I noticed in your photos that your rhubarb was not very wet when you poured it on top of the batter. Mine had a lot of liguid. The next time I will wait to add the sugar and lemon juice after the batter is all mixed so there is a shorter time of the rhubarb sitting in the sugar drawing out the juice. I think this will correct the problem. I have never like rhubarb but this cake is delicious and additive. How weet it sounds. With soya milk I will try it too. This recipe was amazing! Had a hankering for rhubarb-something yesterday and this was exactly it. For some reason, my cake was done after about 30 minutes instead of the recipe’s minimum 40 — but luckily I kept an eye on it, so no problem. I had a bit more rhubarb than the recipe called for, and I worried about weighing down the little layer of cake, so I left out about an ounce. When I saw the finished cake, all rise and fluffiness, I realized I could have piled the extra rhubarb on without weighing it down. Love the lemon and ginger flavorings — will steal that trick for all of my fruity sweets now! I love this cake, and all my friends love it too. It is now my go-to ‘use up the rhubarb’ recipe! I reported making this earlier with crushed hazelnut in the crumb topping and it was great. Nice extra bit of texture. I’m making this again today, also with the hazelnut, but I haven’t enough rhubarb for the whole surface, so half is peach-blueberry. I just laid down a line of crumb topping as a dam before putting on the fruit and the rest of the crumb topping to keep the juices from mixing too much on the two halves. This is really a great recipe! Deb, your recipe changed my husband’s perspective on rhubarb! Besides oysters, rhubarb is the only food he says he will not eat–until now! This recipe was the perfect blend of sweet and tart, and he absolutely loves this cake! Also, I used frozen rhubarb (highly-quality, but frozen), and I found it to be wonderful. I probably didn’t let it defrost enough before macerating, but the flavor was still wonderful. So, although fresh is probably the ideal, frozen came pretty close to perfect! Made this with firm, Ontario peaches and whole wheat flour today. Fantastic recipe, huge hit. Can’t wait for rhubarb season next summer. Thank you! I’ve made five of these since the beginning of rhubarb season here in Seattle. (Has it only been three weeks?) My husband, brother-in-law, coworkers, houseguests, and neighbors all thank you. It’s perfect every time and it’s all the cake I want to eat forever. I just made this. Delicious. Unfortunately I overbaked it just a hair, so the cake layer is a little dry. I also only had about 360g of rhubarb, and it’s still delicious, but I would love more! The tart squishiness of the rhubarb goes so well with the crumble layer and the simple, lemon-tinged cake. I am repeating myself… but this is the perfect rhubarb cake – and probably the easiest one to prepare that I’ve tried so far. I only discovered this recipe very late in last year’s rhubarb season and have been waiting desperately for this year’s first yield – which is in now! :-) What can I say but: happy faces all around when I brought this along to a friend’s this afternoon!!! I can’t choose between this one and the Big Crumb rhubarb cake. The choice is tormenting me! The cake recipes are actually very similar, so this one will definitely have less cake and more rhubarb, but less crumbs. Has anyone made both and has any insight? For anyone who’s wondering, I made this with lime juice/zest and loved it. Made this for a dinner party last night exactly as written, and it was a HUGE hit. People are still talking about it the next day. Thank you for this! The batter was so good that my husband asked if I would make it weekly, bummer that rhubarb season is too short. Also I doubled the lemon peel by accident – great mistake if you ask me. Deb, just consider me the gluten-free tester/converter of your recipes. This cake blew me away! It was so awesome and puffed up so beautifully. I used Glen Oaks rasperry drinkable yogurt instead of sour cream (what I had on hand). I used the gluten-free flour blend from Sarah Bakes Gluten Free Treats (follow the link: http://www.sarahbakesgfree.com/2012/05/sarahs-gluten-free-flour-blend.html ) with great success. This was a big hit at a BBQ in Wyoming. Thanks!! Thanks for a delicious recipe Deb! The rhubarb is just in season here in Sydney, and I picked up a gorgeous bunch (dirt still on!) from the farmers market this morning and made this cake for a friend’s 30th this afternoon. I wasn’t paying enough attention to the recipe at the beginning and put the zest for the whole lemon into the cake batter – but I have to say, the end result was divine, I’d do the same thing next time. I might up the butter in the crumb, mine ended up a little breadcrumbesque, I’d prefer it to clump together a little more. I’m just put the cake in the oven but think I made a fatal mistake. I started the process by doing rhubarb mixture but had to stop for about an hour to feed hungry family. So my rhubarb was swimming in juice/water when I finally got around to putting it on top of the batter I just put rhubarb in and tossed the juice. Should all that liquid have gone in to? I just adapted this recipe to what I had on hand, and it is tasty. I had only 1/2lb rhubarb, and added in blueberries and a small chopped granny smith apple. I halved the cake and crumble part of the recipe, and ended up with a delicious fruity snacking cake! It is good, but I am not sure that I love rhubarb (this was my first time cooking with it) so I may not make it again. I’m a huge pie fan in general and always choose it instead of cake for my birthday. Rhubarb is one of my all-time favorites. So I almost feel sacreligious saying that this cake is (gasp) perhaps even more delicious than my beloved rhubarb pie. If you have no tried this, you are missing out on something fantastic. This reminds me of the mennonite dish called platz, which can be topped with any kind of fruit. There are some interesting variations, too. Like a shortbread crust, topped with lots of fruit, topped with a light thin cake batter. New to Smitten Kitchen. Made this cake this morning and we loved it. I used my last piece of parchment making your strawberry and cream biscuits so I used a glass pan coated with non stick baking spray and it worked great. I did string the rhubarb first. I used all the juice with the rhubarb. This was only my second time working with / eating rhubarb and I’m hooked. Thanks Deb! It took me 7 years to find Rhubarb in Israel – found a bunch yesterday, made the cake today. Took a bite and got thrown back to Starbucks and sweet memories from 8 happy years in NYC. I made this cake several times last summer and this summer – it’s a favorite. I like mixing in a cup of fresh berries to add some contrast to the rhubarb (have mixed in blueberries, strawberries, strawberries at different times) and this cake is always a huge success. I even made it one time for a CIA chef and teacher there and he went back for more than seconds! Yeah! True winner of a recipe. And so much better than the original. Hi Deb, thanks so much for sharing this recipe. I made it using yogurt instead of sour cream but otherwise followed the recipe. I made it yesterday and my fiancé ate more than half of it. He begrudgingly shared it with me and our son. Pretty sure it was only out of obligation. It’s all gone and now we’re sad because we need more rhubarb before making more. Good thing I got a rhubarb plant :-) It needs to grow faster though. I need this cake in my life. Daily. Thank you for thinking potluck, summer gatherings and adjusted this to a 9×13 size!!! I really appreciate it! Took tags off a summer dress today & made rhubarb snacking cake again for a BBQ…let summer begin!!! I made this Friday night and followed the recipe to a “T” and it was AMAZING!!! Don’t wait any longer make this RIGHT NOW!!! Thanks for posting this recipe. The name ‘snack’ cake means this is perfect for a BBQ or potluck, as this cake is sturdy enough to be served without a plate and fork – it can be eaten out of hand (is that correct usage?) The first time I made this with yogurt and I skipped the lemon and ginger. It was good, but I made it again yesterday with the lemon, ginger, and sour cream and it is so much better. I also increased the crumb topping by 50% the second time, which was also good. I live in the part of the country where they do not sell rhubarb in our grocery stores because either we have it in our own yard or we have a neighbor with plenty to share. Thanks again for sharing this delicious recipe. Oh yum. I halved this for a 9 inch square cake. It was perfect for our pod of 3. A large cake would have been eaten entirely. ;) This is the only portion control I am capable of…. Baked for the same amount of time. Also, weights and not just cup measurements are so helpful when modifying recipe. Thank you!!! It was a perfect start to our summer. This is a wonderful cake – Is it wrong that my toddler and I ate this for breakfast this morning? I just made this with the first of the season’s windfall apples that I found on the driveway while putting out the washing! It’s just out of the oven and I love the instruction about testing it – just sliced off a nice corner whilst feigning a ‘concerned, it needs checking’ face. hahahaha!! It is AWESOME!! mmmmmm thank you! My uncle gets really bad hiccups – a piece of this rhubarb cake actually stops them! (apparently rhubarb has anti-hiccup properties – who knew!). Thanks for the great recipe. It’s def. a family favorite. Made these today and they were delicious :) :) I love that they didn’t have strawberries and that you taste the true tart-ness of the rhubarb. Thank you! Hey Deb- have you made this with frozen rhubarb? I didn’t know if it would work or not- if the fruit would release too much liquid or not. Erin — I have not, but don’t see why it wouldn’t work. It shouldn’t have any more liquid in it than fresh rhubarb, but if defrosted first, it might seem wetter. I’m sure you can add it to the batter still frozen. Made this cake yesterday and it was DELICIOUS. – Made it in a large round tin – all good. Really good cake! I used a brown rice flour mix (from Annalise Roberts’s book) to make this gluten-free, so added a little xanthan gum. Also added some toasted, slivered almonds to the crumb. Had a lot of juice in the fruit since I used frozen rhubarb chunks and let that sit for almost an hour with the sugar and the lemon juice. Thought it might be sort of a pudding-y texture, but did not bake up that soft. cake was moist but not like pudding. Thanks for another winner! Love it Deb. It is a go to recipe for my during rhubarb season, which it is in my corner of the world right now. I have been making a baked rhubarb and serving it with plain greek yogurt but decided to make this into 2 square cakes for a Spring Bake sale .. nothing says spring like fresh rhubarb. Have a ton of rhubarb in my garden soon; will definately be doing this cake. This is unbelievable. Thank you!! We made it gluten free with 70% brown rice flour, 20% potato starch and 10% tapioca flour with 1/2 tsp xanthan gum. It was wonderful! Made this tonight as written. I didn’t have a lemon !! so I substituted key lime juice. The cake is super moist and awesome!! love it this recipe is going in my cookbook tonight! thanks!! Loved this cake but huge mistake. Cut the recipe in half! Never again. too good to skimp on! BTW, Gluten free works great! Will make again-the full recipe! And, the rhubarb muffin recipe was delicious too!!!! Hi Deb – I have two questions for you: First, about how many cups would 1 1/4 lb of rhubarb be? We have a source for rhubarb so just get it in bunches, no weight given. (My guesstimate was about 4 cups of sliced up rhubarb.) Second, when I added the sugar to the rhubarb I ended up with lots of liquid which I strained out as I was afraid it would make the cake soggy. My cake turned out rather dry. Should I have added all the liquid from the rhubarb? It seemed like a lot but maybe that’s the secret to success. Thank you! Just made this after a neighbor brought over a bounty of rhubarb. I made it in two 8×8 pans, made an additional 50% of the crumb, and used orange instead of lemon. It came out lovely. I just made this cake–delicious! I had originally planned to bake the rhubarb upside down cake from the NYT but it was a putzy recipe and had mixed comments. So glad I searched for rhubarb desserts on the Smitten Kitchen blog instead. This recipe was like a streamlined version of the NYT one and wow is it yummy. The rhubarb comes through loud and strong yet nicely sweetened. The cake is moist and provides a subtle backdrop. The crumble is a great contrast in texture. I will absolutely bake this again. Thanks for another great recipe! I am focusing on the fact that rhubarb is technically a vegetable to make myself feel better about how many pieces I’ve eaten. I was really nervous about dumping all the accumulated rhubarb juices on the cake batter but it turned out perfectly. This is delicious. I made this cake in 2 8×8 pans. Froze one and the second was gone in 2 days. I am making this my go to fruit topped cake. I’m going to try it with blueberries I have the the fridge today, in round cake pans so I can share the yumminess of this recipe. Delicious! I cut the rhubarb in half and added an equal amount of strawberries. I also cut the sugar on the fruit to 1/2 cup, because of the strawberries’ natural sweetness. Otherwise followed exactly, and it’s wonderful. Great flavor, the cake is super moist, and only subtly sweet. This looks yoummy and will definitely try. Your site is my go to for recipes. Please try to include more cakes for 8″ or even 9″ pans. 9×13 it often too large for my family. Keep ’em coming! Do you think it would be possible to use buttermilk instead of sour cream? I have some buttermilk in my fridge that needs to be used, but here in the UK the buttermilk I can get is thinner than sour cream so wasn’t sure if was a suitable substitution. Yes, it shouldn’t be an issue here. Yogurt would also work. This was perfect! Most of the rhubarb cakes I’ve had before have been mushy/too sour/too sweet – something is always off. Again, this was perfection. I managed to make this while also prepping dinner and not only was it quick, but it was also a fun cake to make. It was delicious still slightly warm that evening and with a cup of coffee the next day. Thanks for the cups measurement! Hi, Deb – I was just about to make this cake and wondered if the flour listed for the crumb is the correct amount? 1 cup with only 1/4 cup of brown sugar? It seemed a lot of flour for a streusel so just wanted to check. :=) Thanks! Totally correct; it’s on the firm side. I need to use up rhubarb that has already been stewed into a sauce. Can I use that here instead of fresh rhubarb? I can’t imagine any harm in trying. I have made this cake several times. I ,love it. The fruit is tart and sweet at the same time. The cake is buttery and rich. The crumbs are delicious. Every person that tastes it , loves it. I loved this – I did add 1 t of vanilla to the batter, and might add more salt next time. I just made this cake. I was a bit rushed and thought it was a bit “steppy”… but most likely wouldn’t have felt so annoyed by all the components of the recipe had not been trying to get it down on a lunch break. (yes .. I know… I know!). haha! But the cake once baked was beautiful. My boyfriend who doesn’t like cake, took a piece with him to work for a whole week… and yes.. that how much it makes.. and yes… that’s how long it lasts and keeps moist. SO take a Sunday morning, bake the cake.. and have for a coffee break snack all week long! I was a little worried about the liquid sugar mix after coating the rhubarb in lemon and sugar…as in, should I really pour all of this over the cake? YEP. Turned out to be the best cake I’ve ever made. Craving it ever since. THANK YOU!! Made this with strawberries & peaches (so less sugar with the fruit) & plain whole milk yogurt instead of the sour cream. It was fantastic! Do you think I could freeze 1/2 of this? As the rhubarb season rolls in again (yay! ), I would like to suggest that this recipe may need a name change. When I am around this cake, I do not “snack.” I *destroy. * Rhubarb Destroying Cake. FYI, these DO mostly work as messy muffins. I didn’t have sour cream or anything close, so I made the batter without it. I filled each cupcake mold with about 2T of batter, 5-6 pieces of rhubarb, and topped messily with crumbs. Baked for 50 minutes. Half a recipe made 7 muffins. Even better the second day! I rarely leave feedback, but am trying out several rhubarb recipes to find the best – tonight are your Strawberry-Rhubarb Crisp Bars! This was easy to make, though the batter is very sticky and thick and hard to spread (kind of a pain with the parchment.) I tasted it molten hot out of the oven (can never help myself), warm, and room temp (cool) this morning. I think cool is best! Almost needs that time to settle into its flavors – so good news for those who like to make ahead. p.s. Plain yogurt as sub for sour cream (didn’t have any) worked completely fine. This cake is amazing! I used cake flour because that was all I had on hand and it turned out great; it made for a little denser cake. I also added strawberries to the mix because I love the combination and then made the topping with wheat flour. My six year old son loves it. Now I know what to do with all of the rhubarb from our CSA! I made this as directed and it’s SO good. It’s going to be hard to not snack on this all day. I cooked it in a metal baking 13×9 pan for 55 minutes. Will limit it to 50 minutes next time. I have rhubarb in the freezer. Should I thaw it first? I think you can work with it frozen here. I just got a big bunch of rhubarb from a friend yesterday and was searching for something yummy to make with it that didn’t include strawberries. 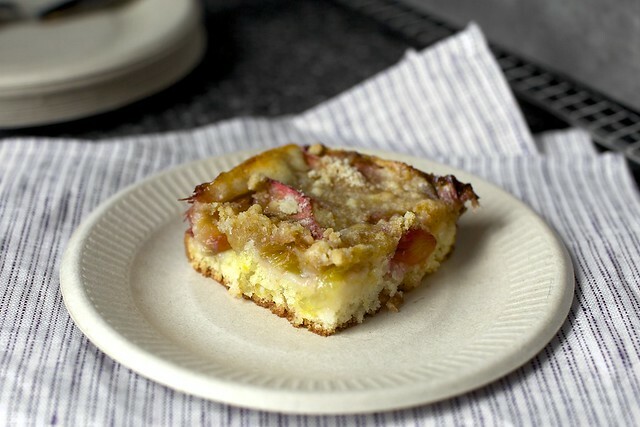 How amazing that I happened upon your recipe for this rhubarb snack cake! Will be making it later tonight and can’t wait to sample it. Great timing ! Probably, but it’s (even more) more liable to move around and look less like the original after baking. Wow, this is really the hardest recipe to F*^&@!$ up! I’ve made it 3 times now, each time realizing I do not in fact have a 9X13 pan nor a kitchen scale to weigh out the rhubarb (nor a brain to remember how much I bought at the farmers market) until it was too late. So, I’ve made this in varying pans, once a 10×15 (ouch! That was painfully thin. Still delicious! ), just now in one 12×12″ plus a loaf pan (yay, more treats! Again, so good). It is just really freaking hard to screw it up! So, if you’re looking for a foolproof recipe with rhubarb, and a way to use a lot of it up at once, this is definitely it! Forgot to mention I’ve never used parchment paper with this recipe because a) I hate to waste and b) we pretty much just eat it out of the pan (!) and it has not ever seemed horribly stuck to it. I have cut it out of the pan to divvy up to friends/coworkers/neighbors and it has left the pan rather nicely. I use glass baking dishes and olive oil spray coating. Just saying it is an option for those without parchment paper! I made this for my book group. It was a huge hit. My husband enjoyed a piece the next morning with his coffee. I didn’t have quite enough rhubarb so I added some thickly cut strawberries to the mix and substituted plain yogurt for the sour cream. Both were fine. This is a bit on the thin side–more like a bar than a cake–but very delicious. I will definitely make this again. This cake is delicious. I added the ginger and a pinch of cinnamon to the rhubarb/sugar/lemon juice and a teaspoon of vanilla to the yogurt (no sour cream in the house) and felt these were good adjustments. I also replaced some of the flour in the crumb with large-flake oats, because in my household, anything with fruit + oatmeal=breakfast. My only regret is that I didn’t make it earlier while the haskaps were still producing because I discovered recently that rhubarb and haskaps is a match made in heaven. I made this last night and I’m eating it for breakfast this morning with coffee, it’s so fabulous! Not too sweet at all – I did use bit of brown sugar in the cake portion ~60 grams. I baked it in an 8 1/2” x 11” ceramic pan and I must say I cannot imagine the cake portion being any thinner! It’s really the perfect ratio of rhubarb to cake (my rhubarb portion is also a bit more substantial because of the smaller surface area). I used half lemon zest/half orange zest, and I added vanilla bean to the cake batter, which I think tastes amazing. Otherwise I followed the recipe exactly and did end up baking it for about 65 minutes. The parchment paper is key for this cake because it definitely would have stuck to the pan if omitted. I made this yesterday for a family BBQ and it really lived up to its name! We ate about 1/3 of the cake for dessert and then the other 2/3 just got eaten over the course of the evening as people picked at it. There was nothing other than an empty pan to take home. I’ve made this cake several times and it’s always delicious!! Delicious cake, wish I could eat the entire cake on my own. I will try to replace the rhubarb with different fruit in the future. I made this for a Sunday dinner. My daughter and I ate half before dinner and everyone else polished off all but one piece after dinner. It is really good. Buttery cake, tart rhubarb, and crumble. I am not even that big a fan of rhubarb. The one lone piece was soggy the next day so this probably is not a great make ahead cake. Can it be made with frozen rhubarb? Drain it? Thickener? Frozen is fine, no need to defrost or thicken. Looks marvelous. I may be making this before your peach bars ( just can’t get past the first step being make peach Jam).